In March I was offered a good position with great pay and benefits as a backend PHP developer. I was excited, and when I started the team seemed awesome and a pleasure to work with. Three days later the horror show began. The existing devs began revolting over non-payment. Some walked out, and quit. Others just stayed, hoping that money would be received by a client (an MLM software company: 2konnect ran by David Griffiths) who was holding up payment. All through the week everyone was bad-mouthing the CEO and growing more and more irate. As the ‘new-guy’, I didn’t know what to think, or which way was up. Even the managers/partners were complaining as they’d gone 5 pay-cycles without any payment. To say things looked bleak would be an understatement. One lesson I’ve always been told in business is : the most important person to pay is your employees. On Friday March 16th, Johnathan M. Penberthy the CEO gave us a chat and said everything would be okay. He promised that a loan was forthcoming, and that his client was paying over the weekend, but that in the next 2–4 days it’d all be worked out. For me, a wave of relief swept over me, and I went to bed friday night without a care. Alas, I didn’t know the CEO, like the other employees — most of which were 1–2 pay periods behind and almost all were new hires within the past few months. Monday, the nightmare took another turn. I arrived to work at 8:45 and went upstairs, turned on my workstation, and began pounding away at code. At 9:15 Johnathan Penberthy the CEO walked by and said hey to the team. Around 9:40 people started wondering where he’d gone. He didn’t seem to be in the building, but his truck was still outside. At 10:15 one of the managers/partners walked in and said he got the weirdest call from Johnathan, that he was headed to jail. I come to find out that the landlord had him arrested for writing a bad check, I further learn that it’s not the only one recently and he has a whole list of criminal records for check fraud. 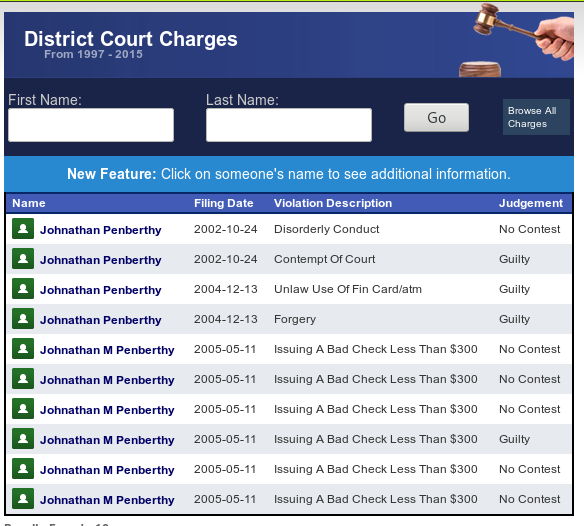 Below you’ll see a record of some of the past fraud cases that I got off a public government site. I can’t speak enough about how everyone else at the company including the managing partners acted honorably the entire time I was there. The only one responsible for this mess is Johnathan Penberthy (and David Griffiths of 2konnect for not paying what was promised in the first place). My hope and reason for writing this post is so thatpotential clients, tech recruiters, and future employees and contractors see this post and know who they’re doing business with before they agree to any business with either 2konnect or Rural Data Centers. Placing a software engineer at a company where they don’t pay is definitely not a good move for any recruiter. I don’t blame the recruiter who placed me, he’s not getting paid either apparently, but this should serve as a warning to all to make sure to do your due diligence before you decide to do business with a person or company. Following the arrest, John reached out to me and offered me a 20k raise from 70k to 90k, and a raise to President of Software Development. 90k, is the most I’ve ever been offered as a developer, so I jumped at it, even though I was uncertain if he could pay. I’d hoped he could. Fast forward throughout April/May I worked 60–100 hour weeks to make up for being the only developer on staff. Around May 20th, I told him — no more. I would not do any more work till I started receiving some pay — anything as a sign of good faith. It’s now June 8th, 2018 and I still have not received a paycheck. I’ve filed and won one wage claim, and filed a second for the following month, and will file a 3rd after the 2nd is approved. Note: when I say ‘won’, it means he is ‘supposed’ to pay, so far he hasn’t, and I’m not a lawyer so I don’t know exactly what recourse I have at this juncture, I’ve reached out to lawyers. If you’re ever going to do business with an MLM company, I also highly recommend you stay clear of David Griffiths and 2Konnect. They are scammers, and do not pay. He has been promising payment to Johnathan Penberthy and Rural Data Centers for about 6 months, and so far has been unable to deliver even $1. In my eyes, both Johnathan and David are lousy and fraudulent businessmen. If anyone knows of any web development positions, gigs, or contracts let me know. I’m open to short, long, and full-time positions or contracts. I live in Utah, but am willing to work remotely. Here is my resume — connect with me on linkedin. Please share and clap! Patrick is a geek, coder, developer in and Laravel Developer in Utah. He’s always looking for Freelance work, while building side projects in his spare time.